The stands looked fairly full on a gorgeous day and ticket sales were “up 15% over last year,” according to Bestwick. Rain’s possible tomorrow, which would add a whole other element to the racing with new Firestone rain tires in the paddock, just in case. A clean start deceptively saw Wickens get around Rossi for third, with Power up a spot too in the early going. Passing in turn 3 is one of the few joys at a place like Belle Isle and ya gotta take ’em where you can get ’em on street courses. Marco opened up a slight lead over Dixon, with a resurgent Ryan Hunter-Reay up to 5th. Old man Kanaan contacted then passed Pags as Goodyear lapsed into “hockey” talk. 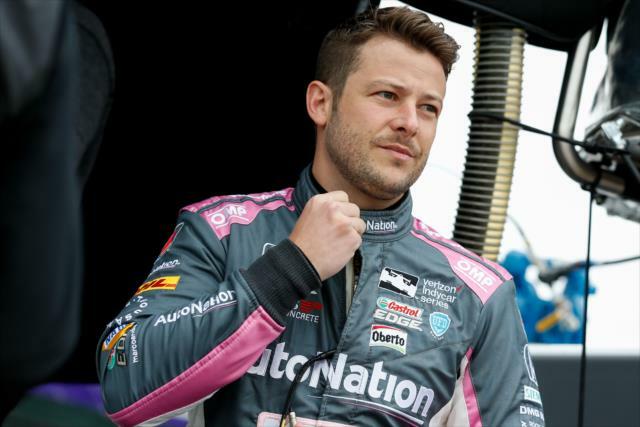 Interestingly, Bestwick mentioned that Dixon said his manager Mike Hull and engineering crew had to change their approach to the new cars, reluctantly and belatedly, but in time for the last couple races. This sure sounds prescient after today. And Indy. Marco and Dixie began pulling away up front, a combination longtime fans of the series are unaccustomed to seeing. Don’t worry – it wouldn’t last. Then the Always Being Crass network – in thankfully its second to last ever race – went to its second break in the first ten laps/fifteen minutes – with no side by side. It was the story of the coverage all day – and all decade. At this point a supposed “pit lane reporter” confused Charlie Kimball, who was battling with rookie Santino Ferrucci, with “teammate Bourdais” who – adding to the confusion – soon ran off track. He avoided the wall, but lost two spots in a forgettable day. Even in the early going, Dixon challenged Marco relentlessly, breathing down the legacy’s neck as RHR got around Bourdais. Rahal was fastest on track running in fourth, but a repeat of last year’s glory wasn’t to be. On lap 47 Graham hit a curb on his right and the car jumped left, slamming hard into the wall. It was the first of only two cautions on the day. But before Graham’s gaffe, the first pit stops approached under green flag conditions with Marco still in the lead. The biggest, most important stop of his (recent) life approached. When it came, the team stumbled. Marco’s 8.4 second stop gave up the lead to Dixon, whose stop clocked in at an incredible 6.4 seconds. Once Rahal pitted – an even slower 8.6 seconds – the reshuffle saw a still to pit RHR up by seven seconds over Dixie, Rahal and Marco. Finally RHR pitted and came out in front of Marco in third, but behind both Dixon and Rahal by almost seven seconds. 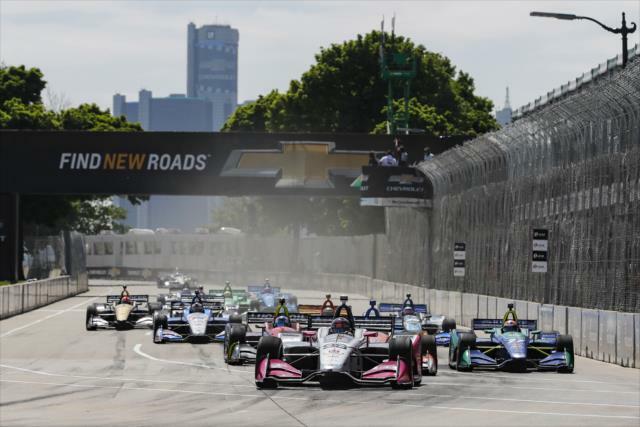 By mid race there’d still been no yellows, though Hondas were dominating in Detroit. Dixie set the fast lap of the race as his taking the lead – and win – started to look inevitable. At least if you’d read our predictions. After Rene Binder’s Excellent Journey off course followed by ragin’ Graham Rahal‘s ruined car, Dixon led RHR after another round of stops and with laps dwindling. The restart finally came on lap 54 after ABC featured Rossi in fourth complaining about his teammate Marco in third on the radio. This was all before the network’s third break of the caution. ABC almost missed the restart again, but didn’t catching Sato sliding around Jones for position. Eddie Cheever finally began to wake up, saying AA and Ganassi are “going at it” up front. In reality, Dixon was cruising comfortably, still holding twice his competitors’ push to pass. Suddenly sprang the second caution with fifteen to go. DCR’s aforementioned Ferrucci – in his first ever race – got Kimball’d, or hit from behind, spinning wildly and slamming into the tire barrier hard in turn 7. After still more commercials, the restart came with 10 to go. Not surprisingly, cars held station as Marco again battled and even contacted his stablemate Rossi, true Indy rivals in the making. Charlie “pinball” Kimball was penalized for avoidable contact for the earlier incident, as was just. Dixie led by .3 seconds as Goodyear droned on, repeating the phrase “power down” for the umpteenth time. In still a further intriguing insight, Eddie said he thought Scott’d win, leading comfortably as he was with four to go. He then proclaimed him “one of the best drivers ever from New Zealand“! High praise, indeed. “Yes boys – well done!” Dixon said into his radio during the victory lap. We’ll take that, Scotty! This entry was posted in ABC, AJ Foyt, Alexander Rossi, Allen Bestwick, Belle Isle, Charlie Kimball, Chevy, Chip Ganassi Racing, Dale Coyne Racing, Detroit, Detroit Doubleheader, Detroit GP, Detroit race 1, Dual in Detroit, Ed Jones, Eddie Cheever, Firestone, Graham Rahal, Honda, Indianapolis 500, Indy 500, IndyCar racing, Jan Beekhuis, Marco Andretti, Michael Andretti, Mike Hull, predictions, Rene Binder, Robert Wickens, Ryan Hunter-Reay, Santino Ferrucci, Scott Dixon, Scott Goodyear, Sebastien Bourdais, Simon Pagenaud, Tony Kanaan, Will Power and tagged 2018 season, Detroit Grand Prix, IndyCar, IRR, irreverent humor by IndyRaceReviewer. Bookmark the permalink.